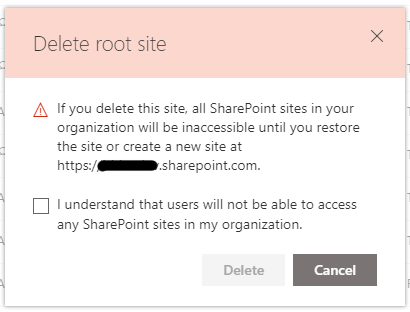 The root site collection of SharePoint Online is still a classic teamsite. It is possible to recreate the root site collection, but be aware of some downtime of sites located in one of the managed paths when there will be a (short) time in the recreation process that there won’t be a site collection present at the root level. When trying to delete the root site collection a warning is displayed about the inaccessibility of other site collections. Navigating to another site after deletion of the root site collection a ‘404 File not found’ message is displayed, because of the missing root site collection. 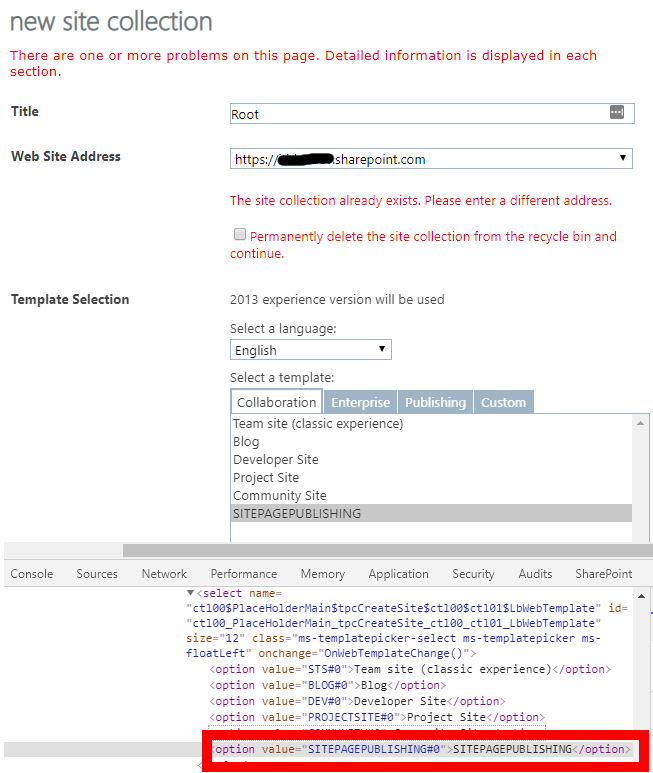 Using the new admin center to create the new site collection doesn’t let you create a new root site collection as shown in figure 2. A site address using a managed path is required. You need to go to the classic admin center. But the option to create a Communication site isn’t available! There seem to be two options now to create a site collection based on a Communication site at the root level. The first one is to create a Communication site in a managed path, save that as a template (using /_layouts/15/savetmpl.aspx after disabling DenyAddAndCustomizePages property of the site) and use the template to create the root level site collection. At first this process seems fine, but after a while the root site collection was missing some updates where site collections in managed paths did got updated. So this isn’t a satisfactory solution. The second option is to use the backend of the site creation process Microsoft provides, just as with creating sites based on other templates using the classic admin center. As seen before the Communication site template isn’t available in the list of templates. Using the Developer Tools of the browser an option can be added to this list to make the Communication site template available. To create a Communication site the value SITEPAGEPUBLISHING#0 has to be used. Just add that as another option to the list and make sure to select it when creating the site collection. When the site collection creation process has finished the root site collection is displayed in the classic and the new admin center. 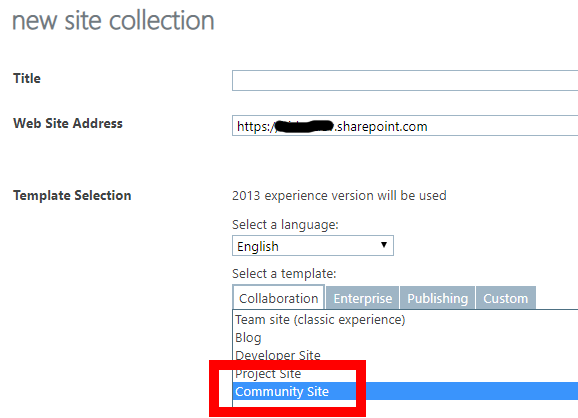 In the new admin center the template used to create the root site collection is listed as Communication site, just like sites created in a managed path using the Communication site template. Now the root site collection is present again all sites in managed paths are also accessible again. To recreate the root site collection based on a Communication site the site creation process provided by Microsoft can be used to add the Communication site template as an option to the list of templates and select that one to create the site collection. Recently updates have been received like the mega menu and footer in all sites based on the Communication site template, including the root site collection.